Bell's Mansion offers three quaint dining rooms and two outdoor patios* for your events and gatherings. Our 1840s estate boasts beautiful wood work, tall ceilings, and vintage charm. 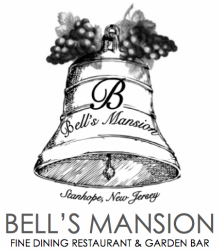 Please inquire via e-mail [ bellsmansion@gmail.com ] or call us at your convenience [ 973-426-9977 ]. Take a look at our order form below for details! BELL’S MANSION OFFERS AN ARRAY OF PACKAGES PERFECT FOR ANY OCCASION. JOIN US FOR CORPORATE EVENTS, SOCIAL CELEBRATIONS, AND PRIVATE DINNERS. OUR MENU FEAUTURES SEASONAL PRODUCE, FRESH SEAFOOD, FARM RAISED MEATS AND ALL HOME MADE CUISINE. OUR FULL BAR BOASTS A VARIETY OF CRAFT BEERS, PREMIUM SPIRITS AND AN EXTENSIVE WINE LIST. WE REQUEST A PRE-SET MENU FOR ANY PRIVATE EVENT OVER 15 GUESTS IN ORDER TO OFFER OUR HIGHEST QUALITY OF SERVICE. WE ASK FOR FINAL MENU CHOICES NO LATER THAN ONE WEEK PRIOR TO EVENT. SOFT DRINKS, COFFEE, AND TEA ARE INCLUDED IN EACH PACKAGE. LIQUOR PACKAGES CAN BE SELECTED UPON THE PREFERENCE OF THE HOST. OPTIONS INCLUDE: CASH BAR • FULL BAR • PER CONSUMPTION – TO NAME A FEW. NO OUTSIDE FOOD OR BEVERAGE MAY BE BROUGHT INTO THE RESTAURANT [EXLUDES CAKE]. WE CAN ACCOMMODATE ANY SPECIAL REQUESTS. PLEASE SPEAK TO US DIRECTLY TO MAKE ARRANGEMENTS. ONE CAKE IS PERMITTED PER EVENT – PROVIDED THAT THERE IS AN ATTACHED RECEIPT FROM BAKERY OR THE CAKE IS IN ORIGINAL BAKERY BOX. HOMEMADE CAKES ARE NOT PERMITTED. CAKE WILL BE DISPLAYED, CUT, & SERVED FOR ALL GUESTS. CAKE FEE IS AN ADDITIONAL $1.50 PER PERSON. WE ENCOURAGE ANY EXTRA DÉCOR THE HOST WOULD LIKE TO BRING IN TO ADD A SPECIAL TOUCH TO YOUR EVENT. WE ASK THAT YOU DO NOT USE CONFETTI ON THE TABLES. PLEASE COORDINATE ARRANGEMENTS FOR SET UP AND BREAK DOWN OF DÉCOR ON YOUR OWN. BELL’S MANSION IS WHEELCHAIR ACCESSIBLE. OUR GARDEN PATIOS ARE NOT WHEELCHAIR ACCESSIBLE. ALL CHARGES WILL BE PRESENTED ON ONE GUEST CHECK AND WILL BE PAYABLE AT THE END OF THE EVENT. THIS WILL INCLUDE NEW JERSEY’S 7% SALES TAX + A 20% GRATUITY CHARGE. OUTDOOR DINING IS AVAILABLE UPON PREFERENCE BUT WILL BE DETERMINED ON THE DAY OF THE EVENT BY BOTH THE HOST AND BELL’S MANSION, WEATHER PERMITTING.